4 Prong Electric VeloBind Strip also refered to as reclosable VeloBind Strips are the binding strip supplies that work with the V-100 Electric Velobinder & V-50 Velobinder. 4 prong EVB strip sets are able to be opened and reclosed. This alowes for easy updating. 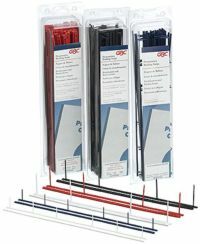 Electric Velobind binding strips are used for all different types of reports, presentations or proposals where a clean professional look is required. 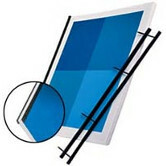 Electric Velobind Strip binding is a perfect binding method for the home office or for large coprpoate presentations. Documents bound with EVB Strips are easy to file or put on a book shelf because of the slim bound binding edge. Electric VeloBind strips come in Black & Navy.